[WIP] Red Sand Purple Sky. Undead night attack. Beran came back to his village and told them what had happened. The villagers listened to him in awe but also very scared, thinking of the possible retaliation from the undead. Beran explained them that their leader, the witch, was slain, and the menace had disappeared. But that night a horrible scream woke up everybody in the village; they were surrounded by the undead. The monsters without the guidance of their master, and very hungry, had headed en masse to the village for a late dinner. Beran, the chieftain and some warriors quickly armed up and dashed outside to face the attackers. They heard strange noises coming from the north, so they run towards it but found nothing; they advanced a little more and again found nothing. But the creeping noises kept coming from the dark outside the village, so they dare to go even further in the night and suddenly discovered a horde of zombies led by an ill pale eater of the dead, a ghoul! One of the warriors of the village madly charged without second thought and smashed against a wall of dead flesh which effortlessly engulfed him. As the warrior disappeared, Beran wisely decided to step aside and wait for the rest. Half of the zombies were attracted by Beran whereas the other half was still devouring the fool, when all the warriors charged and clashed against them. 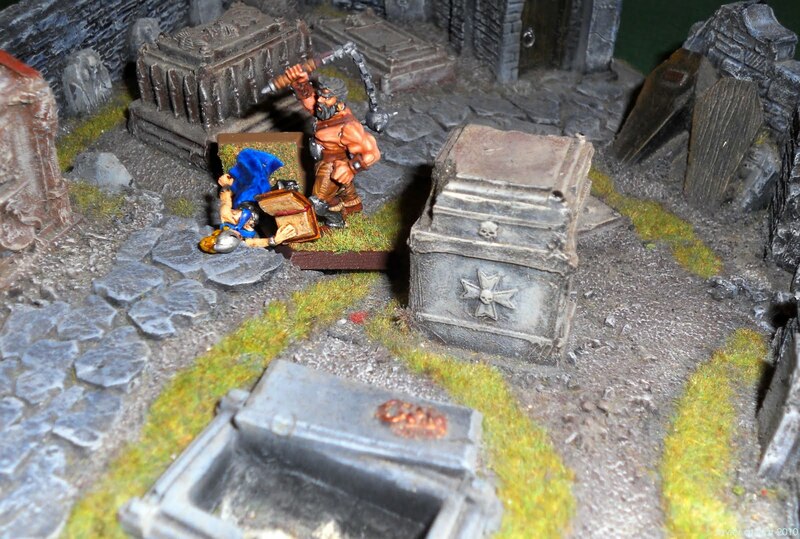 The chieftain sliced off the guts of one zombie and one warrior nailed the ghoul's head with his spear. Beran lose his melee and one zombie hit his groins, causing him a serious wound and forcing him to give ground. 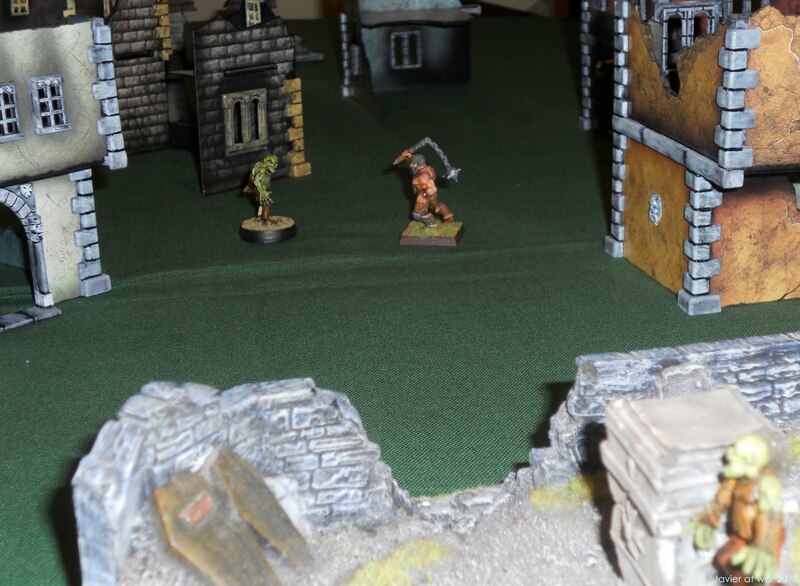 The undead kept pressing but were not able to penetrate shields and armour with bare hands. A veteran warrior killed another zed, but most of the zombies were now behind Beran. Fortunately for him, they were so slow that only two of them could attack him at the same time. Beran spent four dice and managed to kill one and kept at bay the other one. That was close, but he was running out of dice very fast. 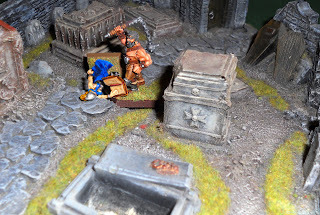 The zombies were resisting the warriors (many draws and pushing back and a few knocks down) and Beran desperately needed to brake from melee and drink a healing potion as he was only one die left from the pool. He was barely holding and waiting for help. Finally the warriors could overcome the zombies and run to help Beran, who could drink his potion and join the fight to help to finish the rest of the zombies. Beran killed two zombies and then moved apart and let the warriors finish the remaining ones. The village was safe, but the villagers blamed Beran for awakening the undead and bringing them to their homes. The council decided to exile Beran immediately, and only let him to take with him the battered shield of the fallen warrior and a new healing potion of 5 dice pool that the healer of the village gave him. Beran left the village without never looking back and headed to the forests of the south in search of new adventures. He had gained 20 APs in this encounter. Bocage, St Andre de L'Epine. 11 July 1944. This is the last scenario from Hit the dirt that we could play with the forces I own, and even so, I had to adapt it. Americans count with four Shermans instead of five according to the scenario, and Germans with one Pak 40 instead of two. Also, the American engineers are represented by German troops in camouflage. The objective of the German troops is to keep control of the crossroad for five hours whereas the Americans must take it in that time and without suffering more than half of casualties. All German forces start hidden and count with three barbed wire sections, three snipers and two mine sections. We played at my game buddy's house and most of the scenery is his. First turn. Americans entering the board. As soon as one Sherman followed by the engineer platoon, passed the hedges by the road, the PaK 40 hidden behind the bocage fired against the leading Sherman, which was hit but not penetrated. As the anti tank gun did not miss, I was afraid of more reactive fire to moving the other Sherman next to the road, so I decided to move forward the one to the left (bottom). But to my horror, two German squads shot in ambush their later Panzerfausts, and destroyed that tank! The Pak 40 shot again but missed. In my next activation I advanced my infantry who was shot by another hidden German platoon with an attached MG, and pinned almost two complete American platoons (crystal markers for pinned squads). 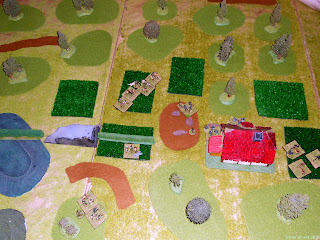 In the firefight I managed to kill most of the German in the orchard, so I forgot about them and crossed with a platoon to the right which naturally was caught in the open by the remaining German squad, who suppressed one of the American squads and snatched the initiative. Now the German player unveiled his 81 mm. mortar FO and bombed my troops in the open, scoring three hits and killing the squad in the centre and suppressing the others! Then the remaining rifle squad in the orchard cap one of the suppressed American squads and retreat out of sight and deployed next to the Pak 40. He also faced his platoon at the bottom forest towards the tanks in the road, circumstance that I used to shoot some smoke in front of the anti tank gun and dash with a platoon deployed in the left. There I killed the German MG but after that I failed my firing and then the German rifles in the wood killed two rifle squads and then the tank in the road with their Panzerfausts. After that I sent my engineers, and assaulted and killed all the Germans in the wood, shot more smoke on the road, rallied all the pinned squads and moved one platoon to the right to cross the road and flank the AT gun, but they stepped into a minefield and suffered one kill and one suppressed. Americans had already suffered more than 50% of casualties and the day was lost. Good game. I think this will be the last Crossfire game for a while, until the Plastic Soldier Later German infantry will be released, and I expand my companies to battalion level. By that time and with a little bit of luck, the second edition of Crossfire will have been released as well. Reconaissance before Ponte Corvo, Italy. 19 May 1944. Our second game was a reconnaissance scenario from the book Hit the dirt as it was company level and it let us use the hidden rules as well. All German forces were hidden and counted with one fortification package and three snipers. I played with the Canadians (my American infantry) and my objective was to successfully observe German positions and make it back alive in less than five hours and a half. We played it at Porto, a local shop whose manager kindly let us play to games he does not sell in the shop, as well as use his tables and scenery (thanks Adolfo!). Canadians entering on the right. Germans hidden. 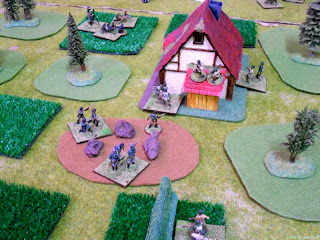 The German player did not place his troops very well as they were very separated among them and without supporting fire lines. Even worse, once a German position was spotted, he left them there unsupported until destroyed, instead of retreating them out of sight, for example. I merely had to attack each time with two squads against it. 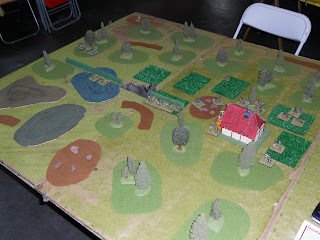 Neither German mortars of snipers had luck suppressing or killing Allies except my FO, and although Canadians suffered a few casualties, they easily managed to explore the whole board in half the time allowed, killing most of the Germans in the process, and getting 20 Victory points and a Victory. I did not get a Decisive Canadian Victory by just one victory point. Below there is the last fire fight of the battle. A Canadian platoon is ambushed in a forest and when another Canadian platoon from the left jumped the hedge to help them, was intercepted by the last German platoon, hidden in rough terrain. He did some damage but not enough, and then in my initiative I finished the German in the wood and then retreat all my troops out of sight from the ones in the rough terrain, to finally exit the east board edge will all my remaining troops. [WIP] Red Sand Purple Sky. A new hero is born! What I am starting here is a personal campaign project. I love Two Hour Wargames (THW) rulebooks and I'm enjoying at the moment the Einar's saga campaign with Warrior Heroes Armies and Adventurers (WHAA) and just finished the Spartacus one with Red Sand Blue Sky (RSBS). Another game that I loved a lot was the computer one "Diablo" from Blizzard. This new project is about that. I want to play a fantasy campaign of one hero ala Diablo; a barbarian who hacks and slashes and accomplishes short quests whereas gains experience, skills and better weapons and armour. To do this I am using RSBS for the melee, with its dice pool system to represent the stamina of the hero and enemy bosses; plus Legends of Araby (LOA) to interact with NPCs and get quests, and also some new things from CR 3.0 and WHAA like PEF markers and new missions. All this together with a lot of house rules of my own to fills gaps and give coherency. I baptised the monster with the temporary name of Red Sand Purple Sky (smart, isn't it?). So I picked up a GW's plastic Marauder and painted it with its head and arms separated, and stuck with blu-tack to later swap them with heads with different helmets and a variety of weapons and shields, as the character progresses in the campaign and gains new items and skills. Our new hero will be a Northern barbarian, a little bit more beefy and taller than his neighbours (XL size), with starting Rep 4, armed with a crude morning star, some light armour on his lower legs and belly, and equipped with an amulet (+1 against some magic spells) and some healing herbs (+3 dice pool when taken -one use-). His armour total weight is 36 so he is allowed to move up to 5 inches. The story starts in his village. There have been some strange missings, the last one a child; also cattle devoured and weird noises around the streets of the village during the night. The villagers gossip that something uncanny is happening in the far and now desolate former village, where the cemetery is. Thus, that night, Beran heads for the cemetery with the intention to unveils the mystery. 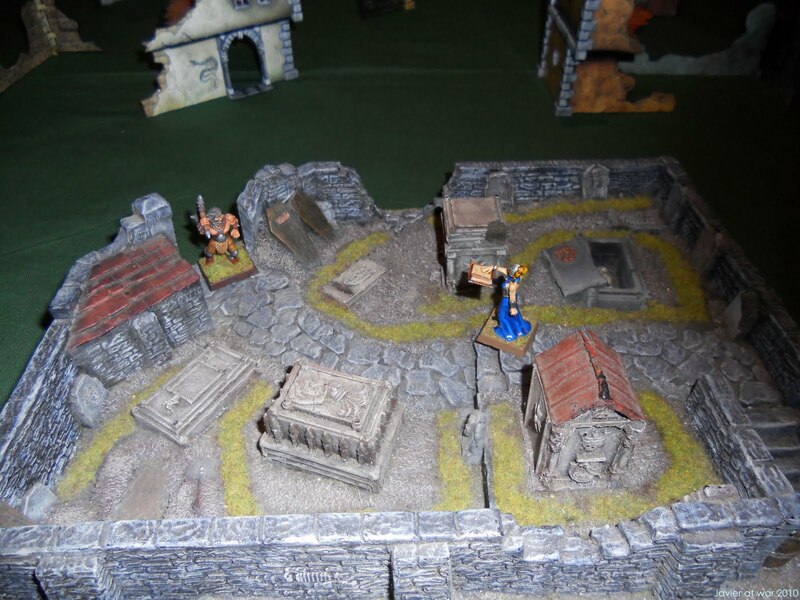 I borrowed all the terrain from two friends but miniatures are all mine. As usual, all pictures are clickable. At the top of the picture below, our hero is about to enter into the ruined and haunted village. The zombies you see are PEF markers representing possible enemy forces. Beran advances and meets the first PEF, but it results to be a false alarm. Perhaps he is a little bit nervous, being a superstitious barbarian and all that. The second PEF resulted to be a lonely zombie who seemed very surprised of seeing somebody alive in its neighbourhood. The zombie does not reach Beran (it moves only 3 inches). In the next initiative Beran attacks it but fails and has to fall back and burn 1d10. Now it is zombie's turn but he fails as a zombie he is, and Beran smashes with the morning star into the zombie's chest and he is out. In this short encounter Beran has spent 5 dice pool and so he still has 15 left. Beran keeps advancing without resting and as he enters into the cemetery, he spots a woman with a floating book in front of her, surrounded by opened up tombs, and chanting some spooky litany that although he cannot understand it gives him creeps. The witch also spots him and gestures her hand to casts a spell. She tries "Shield of magic" but fails. Then she tries again with "Air of Strength" on her before the barbarian gets closer, but once again she fails and moreover, she suffers a Backslash that leaves her dazzled and with 5 dice pool less! Seizing the initiative Beran charges her, but somehow she manages to stop him for now. The witch is still dazzled but nonetheless she tries a new spell. She tries "Suggestion" on Beran, who fiercely fights it off and escapes unscathed. Now Beran counter strikes and smashes her left ankle, knocking her to the ground. 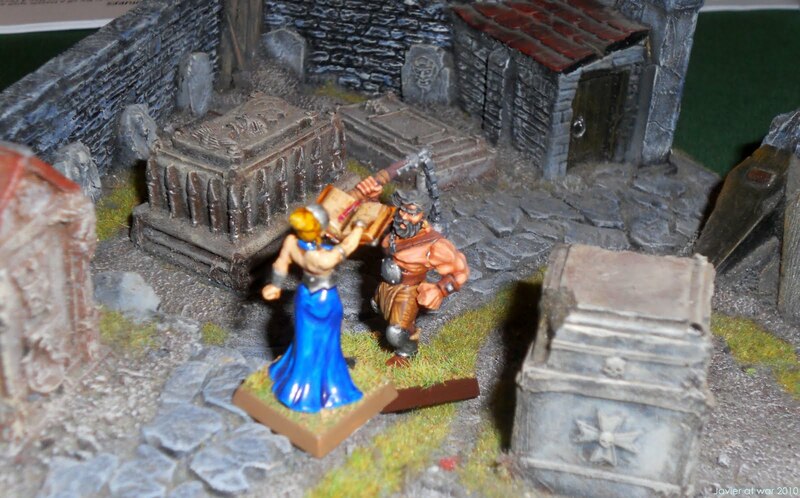 The witch is lying on the floor totally spent and begs for mercy, but the barbarian with a mighty blow, squishes her skull and spills her blood all around. -DIE WITCH! The mystery now looks solved. 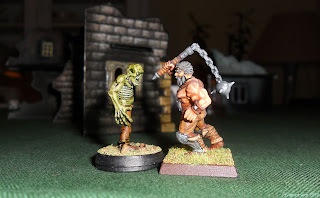 The tiny necromancer was unresting the old dead from the abandoned cemetery. Beran picks up the witch' spells book and goes back to his village to explain everything. He has gained 19 Advancement points. Crossfire is a ruleset of WWII that I bought years ago and never got the opportunity to play it until now. So in one evening I took all my 1/72 plastic soldiers mounted on individual bases and rebased them in bases of 4 x 4 cm. but as I did not have many of them I only made one American company and one German Company. 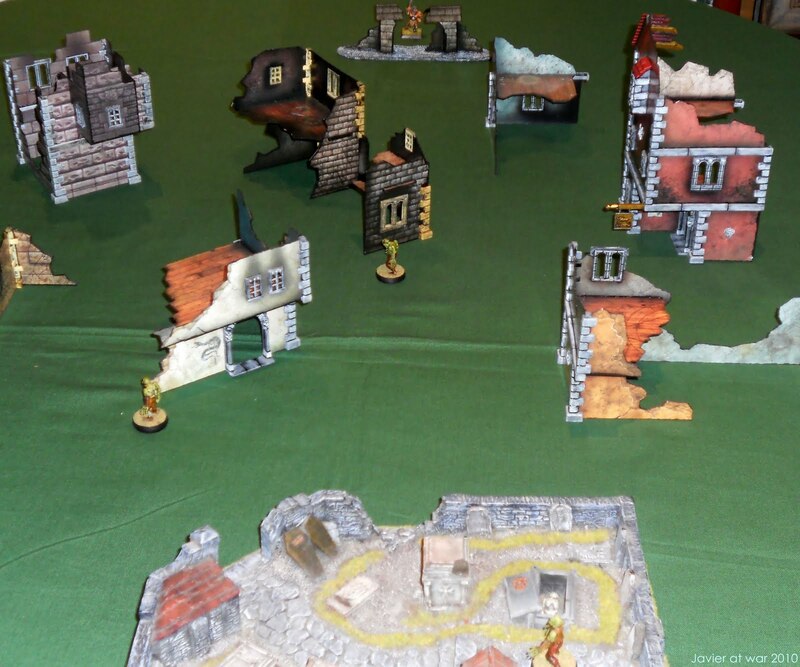 We played the generic scenario Bridgehead at company level, being the Germans the attacker and with their platoons reduced to two squads each, but of veteran quality. 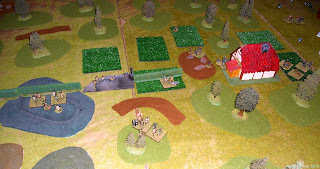 The Americans took the defensive role and deployed one bunker (the grey ruin in the middle of the board), three wire sections (the three hedges next to the "bunker"), and one minefield hidden in the forest to the left of the wire. The Germans concentrated most of their forces on the right flank and after bombing with the 60 mm. mortar and firing with two unattached MGs, launched an assault to the house occupied by the Americans. I was very lucky with the dice rolls and wiped out all the assaulting squads. Here we realized that playing with just one company per side is a bit limiting as once you lose a whole platoon, it is almost impossible to win. In the their next initiative, the Germans tried again the same tactic and this time it worked. They killed the troops inside the house with MG sustained fire (he rolled and rolled and rolled dice without losing the initiative and until he suppressed them twice and killed them afterwards). After that they took the house and the field to its right (so far they have captured three terrain features of four needed to win). As Germans committed all their forces in the assault to the house, they left unguarded their left flank and I moved out from the bunker and the hill one full platoon with a MG attached, and maneuvered them avoiding enemy reactive fire lines, until I placed them on their back and then exterminated all the German in the rough terrain and the house. The American reinforcements were not needed. Game over. Crossfire can be very fast and mobile at moments as other games cannot. You have to pay attention to fire lines and must manoeuvre to outflank the enemy, using smoke, suppressive fire or diversion strategies. Although it is a bit abstract I quite like it and I will play it again soon. I just wish I had two companies of each instead one. Time passes and Spartacus is fit to fight once again. The crowd has been demanding his come back to the arena for a long time, and now he is ready a great expectation has raised. Spartacus is still Rep 6 and this time is confronted against a Provocator Rep 7, especially brought from Rome to fight with him. Bets are high in favour of Spartacus, the hero of Capua. The gates are opened and the gladiators jump into the arena, receiving a roaring welcome from the mob that has waited and waited for this event for so much time. Spartacus is the first to attack and tries to outflank the visitor, but the Provocator is an old dog and blocks him without effort and scratches Spartacus on his chest with a gesture, like saying there is going to land his next blow. Now the Provocator tries to hit Spartacus with his big scutum, but fails and must fall back to avoid the counter attack. Spartacus tries again to outflank the Provocator on his unshielded side but again is blocked, and before he can recover, his opponent thrusts his chest, inflicting him a serious and painful wound. The crowd cries in disbelief, seeing his hero in trouble and his bets in danger. Spartacus insists on flanking his enemy as his big shield is a barrier almost impossible to go through, but the Provocator proves to be very skilled and continuously blocks all his attempts. Fortunately for him, he wins the round this time and manages to place his sword on the Provocator's cardiophylax, and although the strike came too weak that couldn't penetrate it, it was enough to knock him to the ground. Regretfully, Spartacus misses this opportunity and the Provocator stands on his feet very quickly. Spartacus keeps trying to flank his opponent with that tenacity so typical from barbarians, but he is only spending more and more dice from his pool. He fails this time miserably and the Provocator punishes him with a new scratch on his left leg. Immediately after that, the Provocator attacks him, severely slashing the same leg again. A murmur from the crowd starts to rise with this new wound on Spartacus. It seems he cannot surpass the Provocator's defence and that he is loosing a lot of blood now; he is running out of time and of tricks. New bets quickly come and go among the spectators. Sensing a change of mood in the fight, the Provocator leaves his defensive stance and starts to behave more aggressively. He strikes repeatedly Spartacus' head, who is saved by his helmet but knocked to the ground. The crowd is changing sides and starts to boo his former hero. Spartacus desperately manages to strike his enemy on his leg, forcing him to fall back and giving him time to stand on his feet; he catches some breath then, but he has already lost so many dice from his pool that it does not make any difference. 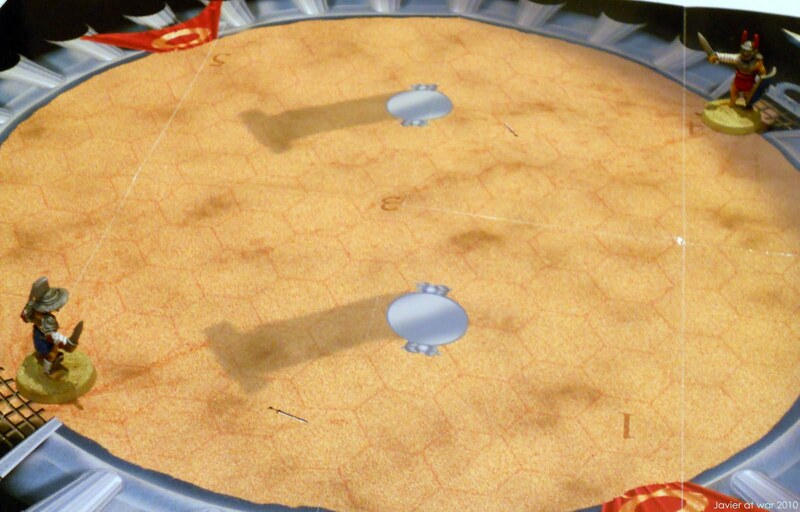 The Provocator keeps the pressure and attacks Spartacus right away, knocking him to the ground again. By the gods this is looking really ugly for Spartacus! Nonetheless, he manages to fence the Provocator off and rises ready to counter strike with what it seems to be his last chance. But he is fighting now with a minus one to his Rep due to the fall and passes 0d10! He then falls to the ground with the Provocator's gladius deeply buried in his chest. There is a silence in the arena. Spartacus is dead, dead! A riot commences as the audience wants to recover their bets, as the corpse of Spartacus is retired from the arena. Spartacus is disposed of all his armour, his blood sold to some patrician women, and his corpse piled up together with other dead from the day. Nobody remembers him anymore. Who will pronounce his name once again? Well, that is the end of a great campaign. I was about to ask for mercy right after Spartacus' last attack but then it was too late. 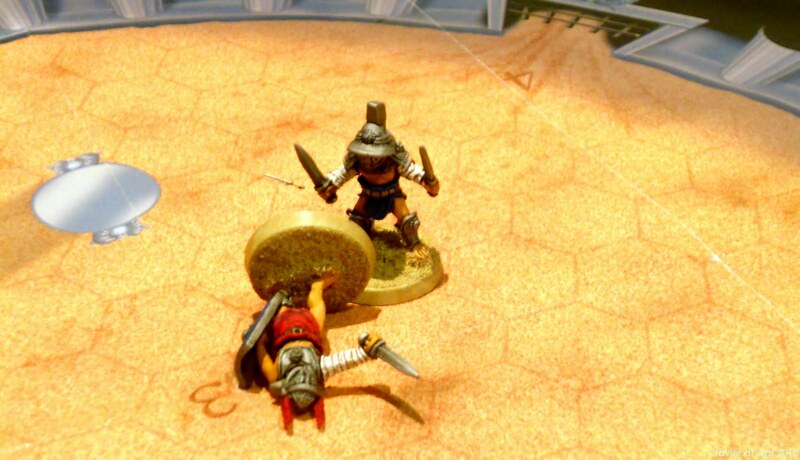 I hope you all have enjoyed this campaign of gladiatorial fights as much as I did. 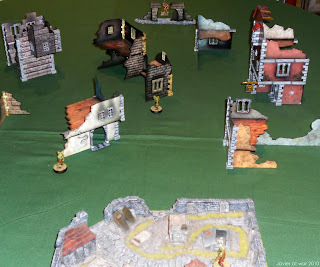 Warband for Mordheim: Norses from Border Town Burning. 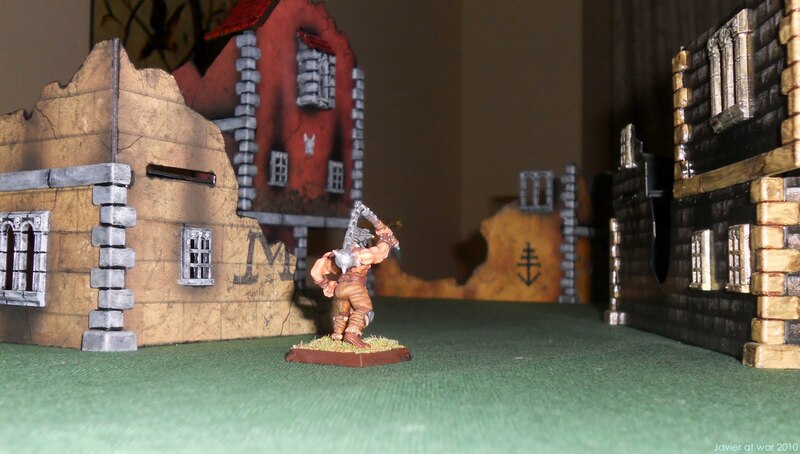 Taking my already dipped marauders and some more forgotten figures I had around, I decided to make a Marauder Warband for Mordheim, for the great supplement Border Town Burning. Aprovechando los marauders que ya tenía dipeados y algunas figuras sueltas que andaban por ahí, me decidí a hacer una banda de Mordheim para la campaña Border Town Burning. The two Chaos Champions. One of then with a converted steel whip. The Champion with whip next Warhounds to enrage them. The heroes. The first to the right is the Condemned. Dipped Marauders as henchmen. The one in the middle with a converted big axe. The whole Norse warband excepting the Chaos Spawn. I'm looking for a very cheap Chaos Spawn but I haven't had any luck so far. Estoy buscando un engendro del Caos baratito pero hasta ahora no ha habido suerte. Painted some Valiant 20mm. hard plastic WWII Germans. They look much better in these pics than how they really are, but anyway. I painted them with dipping and then highlighted with the same base colours, and finally added the camouflage strips. They are based on coins of 5 cents of euro. I'm planning to use them for Nuts! and when I paint some more, for Disposable Heroes. I'm not convinced with the results (taking into account that it's speed painting), and I'm thinking to use the same technique with the next batch, but using GW's Devlan Mud and Ogryn Flesh instead of the traditional dipping. I'll be using the officer as tank commander. The camouflage pattern above resulted better than this one IMO. By the way, if you are thinking about buying some of these nice models, I suggest you to look for them in Ebay first. From experience I can tell you will find them new, cheaper and with better service.